Breakfast buffet and à la carte lunch offerings at The Fess Parker - A DoubleTree by Hilton Resort. : For 50 years (1911-1961), part of what is now The Fess Parker - A DoubleTree by Hilton Resort was the site of a roundhouse, a railroad service station with an engine turntable that rotated steam locomotives around to travel in the opposite direction. 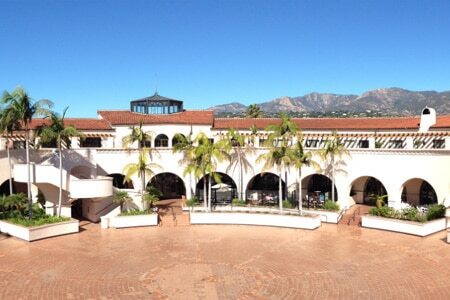 When the hotel was built, this large circular area was transformed into the Plaza del Sol. Views of this rotunda and the ocean beyond may be enjoyed from the terrace of The Roundhouse, the casual restaurant whose name also pays tribute to the property’s transportation history. Meanwhile, the interior dining room is open to the lobby. For breakfast, a buffet is offered complete with a chef preparing made-to-order omelets. At lunch, guests will find an à la carte lunch menu including salads, sandwiches and pastas.